HaKosem is a popular falafel and shwarma stand with outdoor tables, lively music and arguably the best falafel in town. They are one of the few eateries that offer gluten free falafel balls and gluten free pita bread. The falafel at HaKosem is soft and green on the inside from the fresh cilantro and brown and crispy on the outside. 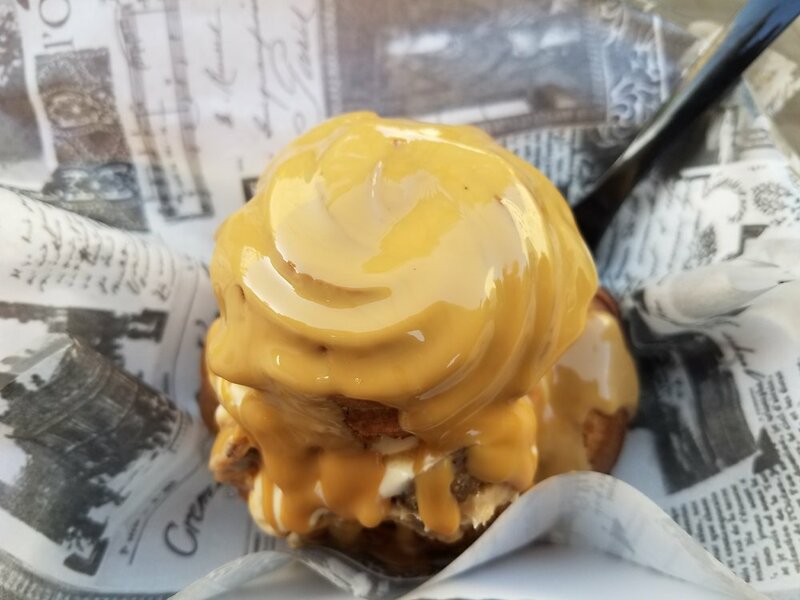 You can taste the deliciousness of the deep-frying in every bite! There is always a long line of locals waiting to get their HaKosem fix. They have an assembly line of staff set up in order to accommodate the high demand and will offer falafel ball samples while you are waiting in line. Hakosem is open on Shabbat so there is no hechsher, but all of the food is Kosher. 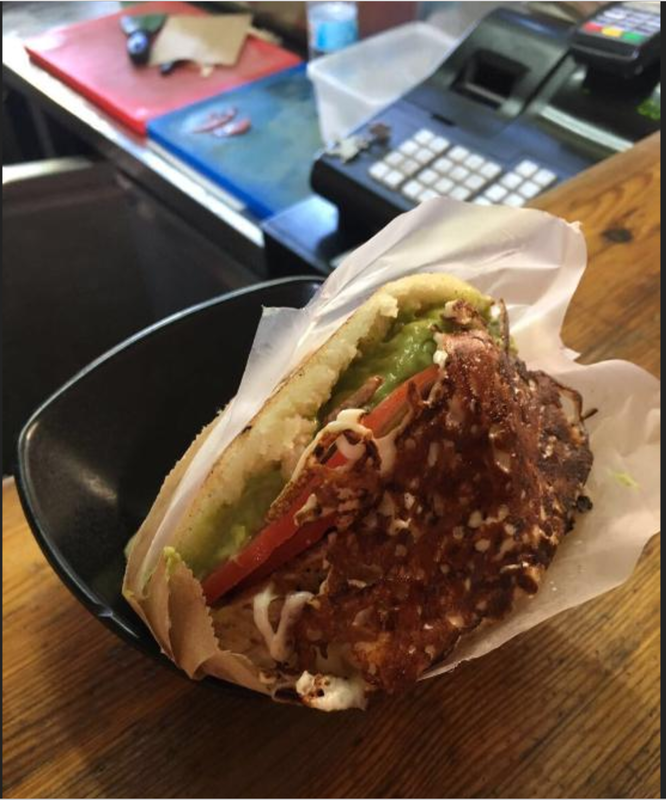 One of the first falafel places in Tel-Aviv to offer gluten free pita and gluten free falafel to customers, Falafel Hippo has a loyal gluten-free customer following. Falafel Hippo's hummus is really delicious and they are completely vegetarian and Kosher. They recently started offering vegan and gluten free shwarma made from soy. They gave me a taste and it was actually really delicious and tasted pretty authentic! 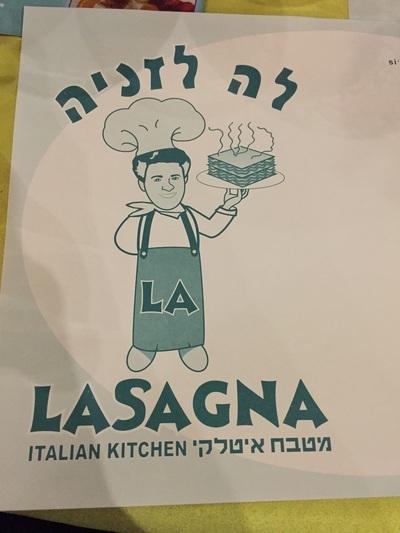 LaSagna is a dairy and kosher restaurant that has a separate menu dedicated to gluten free options. Their menu is split into three parts. Regular, gluten free, and whole grain- so they cater to many different diets. While it is fairly common today to have access to gluten free pizza and gluten free pasta in major urban centers, it's not often that you find gluten free lasagna, and in multiple flavors too! The lasagna is served in a hot ovular dish, so straight out of the oven that the cheese is still bubbling when it's set on the table. All of the lasagnas have a beschamel sauce base instead of a traditional tomato sauce base. 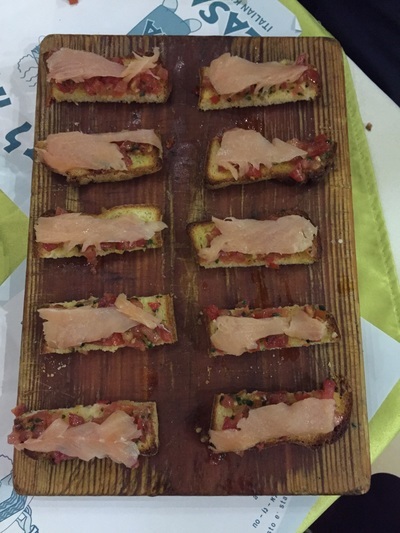 The gluten free salmon bruschetta was very nice and a generous portion. The gluten free bread had a slightly gummy texture but nice flavor and crispy toasted crust. The gluten free pizza was decent. It tasted like home-made pizza. I enjoyed that it had a thicker crust than most gluten free pizzas. Meatos is a casual and pricey burger and steak restaurant. A large restaurant with a patio for outside seating, Meatos is a trendy and busy spot. It seems like it is crowded at all hours of the evening, so I would suggest making a reservation in advance. Meatos does not have special gluten free items like gluten free burger buns and gluten free bread, but they offer a separate gluten free menu, which outlines all of the items on their regular menu that are suitable for gluten free dieters. The menu offers the Meatos hamburger but specifies that it is served without a bun. The food is very basic and the service is not very attentive. Not a "special occasion" kind of restaurant, but solid food with no surprises. Serona is a new beautifully re-furbished outdoor development in Tel Aviv with retail shopping and restaurants. On a Saturday night, we had dinner at Biga, an Israeli style cafe. We sat down at 11pm and the outdoor seating area was packed. The menus are on iPads with photos and descriptions of each dish. Each dish has an Israeli style twist, and breakfast is served all day. We ordered two types of Shakshuka, one with feta cheese and eggplant and the other with goats cheese and roasted red pepper. Shakshuka is a traditional Israeli breakfast dish- eggs cooked in a tomato and vegetable base and served in a hot skillet. 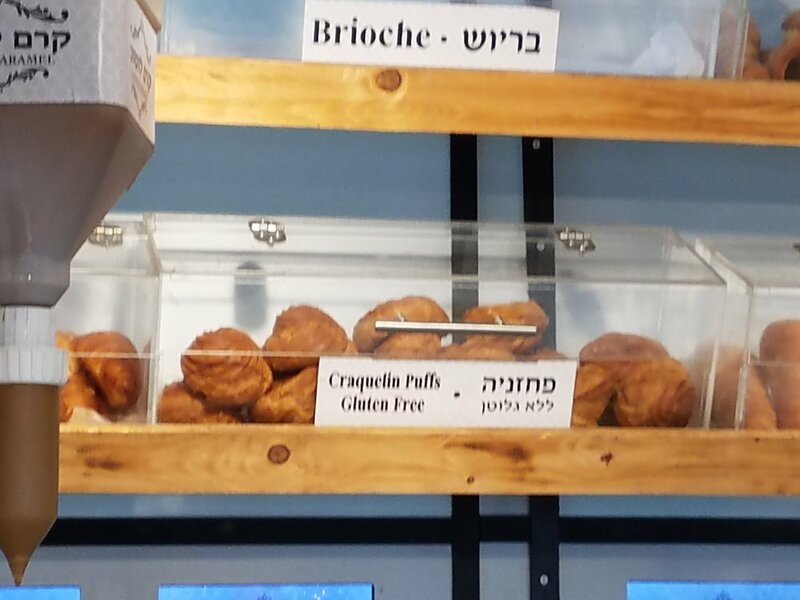 The Shakshuka at Cafe Biga is normally served with challah bread, but there is an option for gluten free bread too. It looks like they use the same gluten free roll that Cafe Aroma uses. They offer sandwiches on this bread as well. Nothing to write home about, but it's always nice to have a gluten free bread option. Our service was very bad. It took 20 minutes for a waiter to come to our table. We ordered the shakshuka well-done and it came out runny. The gluten free roll was very dry when it was served. After they baked the Shakshuka for longer, it was really delicious. Best of all, it was fun to be able to eat shakshuka for dinner! Walking back from the Dizzengoff Center in Tel Aviv, we spotted this gem! Josh and I love gelato and always stop to look at the flavors. This gelato was beautifully displayed in its case, besides what appeared to be ice cream sandwiches. There were syrup cases whimsically hanging from the ceiling and baskets of fresh baked goods lining the walls. After taking a closer look, we discovered that this place had quite a few gluten free offerings! The concept is pick your cookie or pastry and stuff it with your ice cream and topping of choice. Pastry choices included baskets of croissants, doughnuts, eclairs, cream puffs and brioche. There were chocolate chip and double chocolate cookies for ice cream sandwiches. Now for the gluten free highlights! The shop offers a gluten free chocolate cookie and macaroon cookies (almond based French cookie) that is also gluten free. The best part of all is the gluten free cream puff made of gluten free choux pastry. We tried it all, but our favorite was the stuffed cream puff! Typically, gluten free cream puffs are dry. But this one was light and fluffy as choux pastry should be. 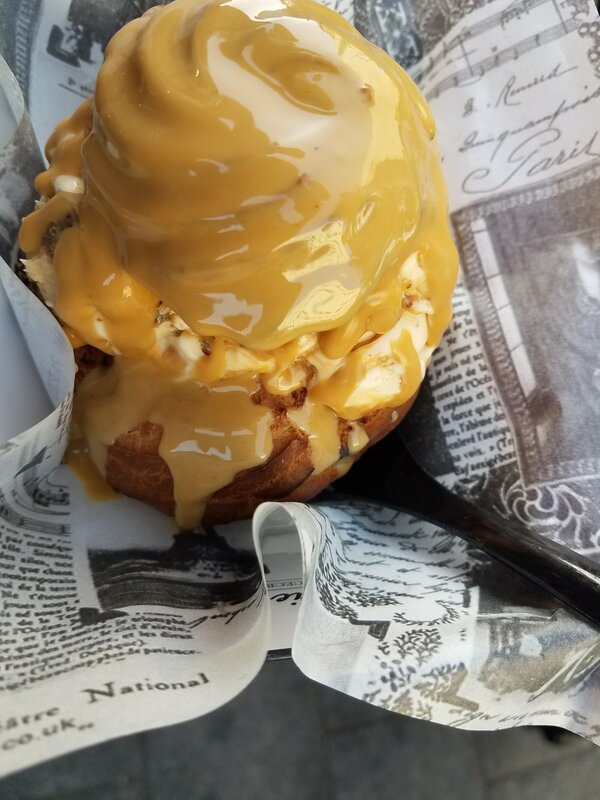 Picture this...a giant cream puff sliced in half and filled with two scoops of Snickers flavored ice cream AND topped off with peanut butter sauce! A little slice of heaven! We event went back for seconds the next day! Dosa bar is a casual, cool and inexpensive spot for vegetarians and Indian food lovers! Everything on the menu is gluten free and vegan and the menu is simple yet innovative. Dosa Bar offers four types of dosas. Dosas are a native street food of southern India, similar to a crepe made with rice and lentil flour. 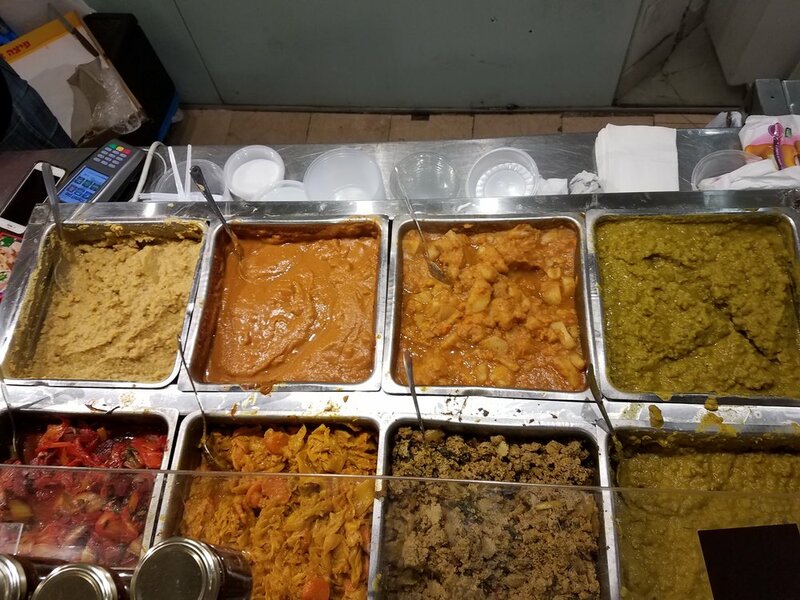 Dosa bar offers dosas in four varieties – yellow with potatoes, onions, carrots and spices (38 NIS), orange with sweet potato, carrot, onion, Indian spice and green onions (40 NIS), green with swiss chard, squash, onions and Ag’oan (44 NIS) and dosa mediterranean (46 NIS). All dosas come with sambar – a lentil soup and chutney coconut dip. Most of the seating is at outdoor tables with bar stool seating. You'll find lots of free spirits eating here. Recommended for a quick and healthy meal! Tel Aviv Italian restaurants are increasingly offering gluten free pasta to patrons. However, it is difficult to come by gluten free pizza in Tel Aviv. Donattelo is a super casual pizzaria that sell pizza by the slice and also offers gluten free personal pizzas. The pizza looks like a New York style thin crust pizza. 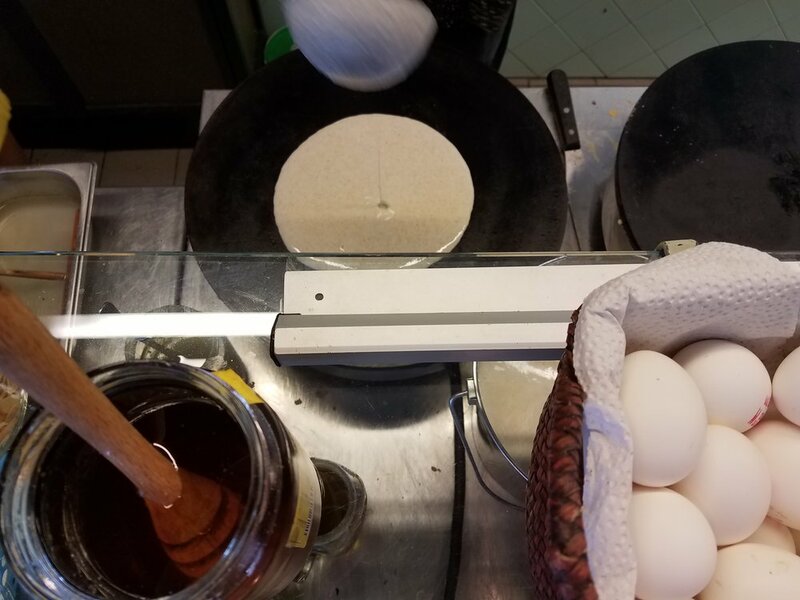 There is a counter against the wall and high stools for sitting, with oregano and garlic shakers, typical of a New York pizzaria. There are a couple of tables with benches outside the restaurant. The pizza was good but nothing to write home about. The cheese was a little hard and there wasn't enough sauce. The dough was a bit on the chewy side. I did not try the regular glutenous pizza, so I don't know if it was good. If you are in the mood for gluten free pizza, I would recommend giving it a try since it's difficult to find gluten free pizza in Tel Aviv and it will hit the spot. A good option for a quick casual lunch or take-out/delivery for dinner. If you couldn't tell from it's name, La Creperie Bretonne is a Brittany themed crepe restaurant. This charming creperie makes savory crepes (crepes sarrasin) made from 100% buckwheat flour. The sweet dessert crepes are made with wheat flour and are not gluten free. The menu options are very creative. Choose from a variety of cheese, meat and fish fillings. We watched them make our fresh crepe right in front of us and enjoyed it with a cold glass of cider! Dim Sum Shop is a small fast food concept eatery in Tel Aviv that serves dim sum - steamed Chinese dumplings- with a large variety of flavors and fillings. Most of the dumplings are made with wheat flour, but there are three gluten free options as well as several vegan flavors. The gluten free dumplings are made with rice flour instead of wheat flour. The gluten free fillings are chicken, sweet potato and tofu vegetable. The dumplings are always fresh and flavors are subject to availability. 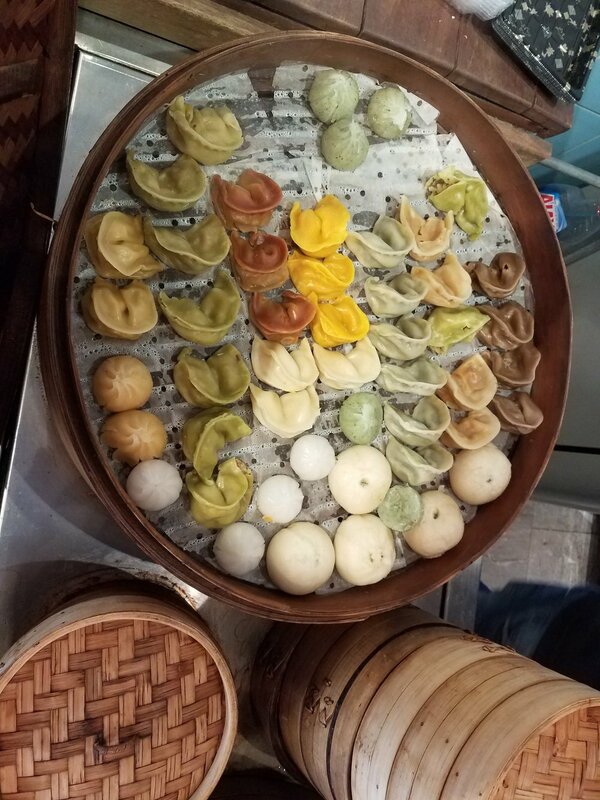 When we were in the mood for an afternoon snack while walking around the streets of Tel Aviv, the Dim Sum Shop was a perfect place to stop by and pick up a couple of dumplings to tie us over until dinner! Agvania is a fast food pizza eatery chain with locations in multiple cities in Israel including Tel Aviv, Jerusalem and Hertsliya. The pizza has thin crust and is served by the slice. The chain recently added a gluten free option, which has to be ordered as a personal pie (not available by the slice). I did not taste it, but I was excited to see the option. Agvania is a well known pizza chain in Israel, and all of their locations have rolled out the gluten free crust. A casual and inexpensive option for families with children. Recommended for take-out and delivery option! Cafe Aroma was one of the first cafes in Israel to start offering gluten free bread. When I visited Israel in September 2011, before the gluten free craze started spreading, I was pleasantly surprised to see that Aroma offered sandwiches on gluten free bread. I was living in Paris at the time, where if you said you could not eat wheat, they pretty much spit on you. What a refreshing experience it was to sit and enjoy our haloumi cheese and grilled Mediterranean veggie gluten free sandwiches while sipping iced coffees and frozen lemonada! Select locations are Kosher and closed on Shabbat. Dizengoff Center, 50 Dizengof St. The food fair happens every Thursday and Friday in the basement level of the Dizengoff Center and offers a variety of homemade food in various cooking styles. Exhibitors offer home made and authentic food, a wide variety of cuisines from around the world: cuisines, Tunisian, Moroccan, Asian, Iraqi Italian and more. The prices are very reasonable and quantities are plentiful. The Food fair is an excellent option for local residents to find high quality food for Shabbat without the need to cook it themselves. The food is extremely fresh and flavorful! The most fun part is walking around the stalls and tasting all the different dishes. Exhibitors hustle crowds to come taste their specialties in hopes that they purchase on the spot. This year we noticed a new Ethiopian stall where everything was gluten free and vegan. The specialty was an Ethiopian Injera, which is a gluten free fermented flatbread made of teff flour. The fillings were lentil, chickpea and vegetable based curries. It was super filling, satisfying and delicious! Aperas Venezuelan is a small corner stand in the middle of the Shuk Hacarmel. In the crowned ailes of the market, it can be hidden, so if you are like us, you have to seek it out. Look for the sign that says "Gluten Free" in English. Everything they have on the menu is Gluten Free because they use a corn based flour for the aperas. The aperas start at 30 shekels and upwards, which is a bit pricier than other food from stands in the Shuk, but if you’re looking to try something different, it’s worth it. The corn based dough looks like a pita shaped pocket and is used as the base for the Arepa. Then you can choose your fillings, which include a delicious combination of meat, avocado, some veggies, and LOTS OF CHEESE. Then it is set on the grill until the cheese melts on the inside and crisps up on the outside. Since we don’t eat non Kosher meat, we got the vegetable option. The highlight of the arepa is the crispy crunchy cheese that is brûléed on top of the arepa. On our walk back to the hotel from HaKosem we passed this adorable juice bar. Many of the juice places in Tel Aviv are small dingy stands that seem to lack a hygienic appeal. This place looked clean and attractive with a healthy menu and a sign that said 100% gluten free. We walked in to check it out and spoke with the owner, who had just recently opened the location. He was previously in a small location across the street and moved and expanded the concept beyond just juice. Everything at La Fruiteria is gluten free and vegetarian. They have juices, smoothies, rice paper wraps and frittatas. We didn't try anything, but it is a very inviting environment and the owner is very friendly. My husband used to love the pizza at HaPizza when he studied abroad in Tel Aviv pre-celiac diagnosis. On our last day in Tel Aviv, we walked past and noticed that they now offer gluten free pasta. Didn't have a chance to try it but something to look forward to for next time! Porto is an Italian restaurant at the Namal, the Tel Aviv port area. We love to walk around HaNamal to enjoy the bustling ambiance overlooking the beach with the ocean breeze and fresh air. We passed by Porto and took a look at the menu. They offer a gluten free version of all of their pizzas and pastas. I don't know if they are any good, but certainly worth a try!